As a parent, I want to make sure my kids are getting their 5 a day but with picky eaters in the house, that’s not always the easiest thing to do. I’ve tried all of the tricks, and while they sometimes work, some days my kids just want to eat pizza and chocolate. I’m not alone in this fight to get our kids to eat healthier. Kids absolute refusal to eat fruits and vegetables has inspired many moms and chefs around the world to create deceptively delicious meals by becoming veggie smugglers, hiding that good stuff in their favorite food. Whether it’s adding butternut squash to mac and cheese, cauliflower to mashed potatoes or using avocado to make chocolate mousse, some parents feel they have no other option but to sneak these good foods into their kid’s favorite culinary dishes. But is sneaking healthy food into our kid’s favorite dishes really teaching them healthy eating habits? The USDA Dietary Guidelines recommends kids eat at least 5 fruits and vegetables a day. Adding pureed fruits or vegetables to meals is one way parents have found to help get their kids the recommended five a day, but health professionals are skeptical if it actually teaches healthy eating habits. One study published in Social Science & Medicine found that hiding vegetables in meal can be confusing for a child. By adding pureed butternut squash or cauliflower to mac and cheese, children cannot easily distinguish between the homemade version with the hidden vegetable and foods served outside the home without the vegetable. While adding pureed vegetables can help increase the amount of vegetables eaten by children at home, it should not be the only way vegetables are presented to children if you want to encourage healthy eating habits away from home. Another study published by Barbra Rolls at Penn State found that adding pureed vegetables to favorite foods almost doubled the amount of vegetables eaten by kids and had no effect on the amount of vegetables eaten as a side dish. While the researchers noted adding pureed vegetables can be beneficial to increasing the amount of vegetables eaten by kids, they also agreed it shouldn’t be the only way vegetables are served to children. Research supports adding pureed vegetables to our child’s favorite dishes is a great way to help our children get their 5 a day, but caution it doesn’t support encouraging healthy eating habits outside of home unless the child is involved in the preparation of the food. Getting your children in the kitchen to help prepare their favorite dishes with these hidden veggies is the best way to encourage healthy eating in and away from home. I found this to be true with my own kids. I began by sneaking in pureed vegetables into mashed potatoes, pizza sauces and yummy desserts to develop their tastes for these healthier options. I even made meat balls out of lentils, cauliflower and chicken, and after a few successful attempts at eating these veggie smuggled meals, I brought them into the kitchen to help me make them. My oldest, who wouldn’t give an avocado a second look, was shocked that her favorite chocolate mousse was made with this green fruit she despised (don’t worry, I share the recipe below), and my youngest who wouldn’t eat anything on her plate if the cauliflower touched it now cleans her plate that is filled with those little white trees. Getting your kids in the kitchen will not only help encourage healthy eating habits but will also give them the skills to cook healthy meals once they leave home and start their own families. Cooking is a lost art and every child deserves to be taught how to cook. Start your kids young, even the smallest of hands can mix flour or pour in measured ingredients. Add all ingredients into a food processor and blend until creamy and smooth. Put mousse into a plastic zip bag and press to remove as much air as possible. Refrigerate for 1-2 hours. 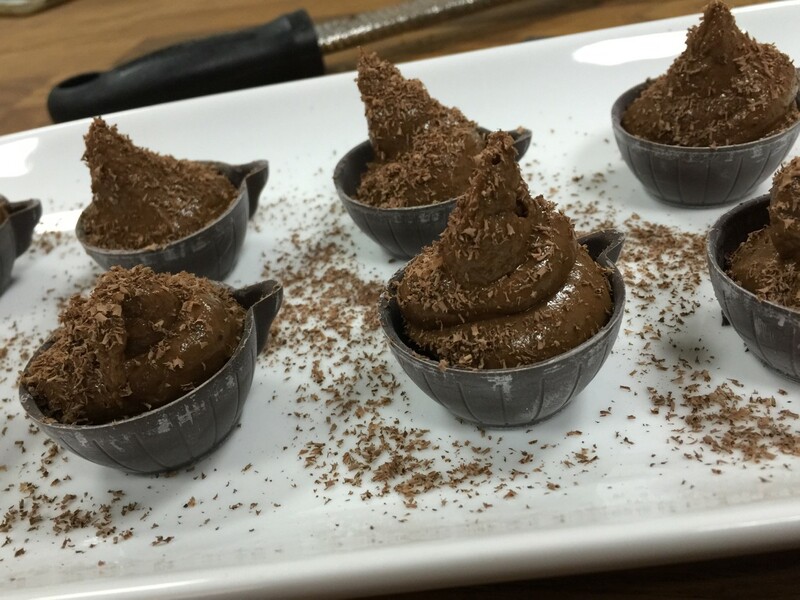 I served mine in little chocolate bowls, but this can be served in small dessert dishes too. To serve, cut the corner tip of the plastic zip bag and squeeze mousse into serving dish. Garnish with a shaving of dark chocolate and enjoy. The mousse will keep for about 3 days in the refrigerator, but is best right away. Connell PM, Finkelstein SR, Scott ML & Vallen B. Helping lower income parents reduce the risk of food waste resulting from children’s aversion to healthier food options: Commnet on Daniel. Soc Sci Med. 2016;150:286-289. This entry was posted in Arizona, Cooking, Diet Tips, Food, Health Tips, Healthy Eating, Kids and tagged Children, cooking, Health, Healthy Eating, In the Kitchen, kids, Kitchen. Bookmark the permalink.